This black wagon has an automatic transmission and is powered by a 2.0L H4 16V GDI DOHC engine. Driven via that frugal motor it gets 8.4 L/100 km in the city and uses just 6.5 L/100 km out on the highway according to Transport Canada. Our Impreza's trim level is 5-dr Sport AT. The Sport trim takes the Impreza to the next level. It comes with an 8-inch infotainment system with Bluetooth, SiriusXM, 2 USB ports, six-speaker audio, aluminum wheels, LED turning headlights, a side sill spoiler, a power sunroof, premium cloth seats, a power driver's seat, heated front seats, aluminum pedals, blind-spot detection, lane change assist, a rear view camera, and much more! 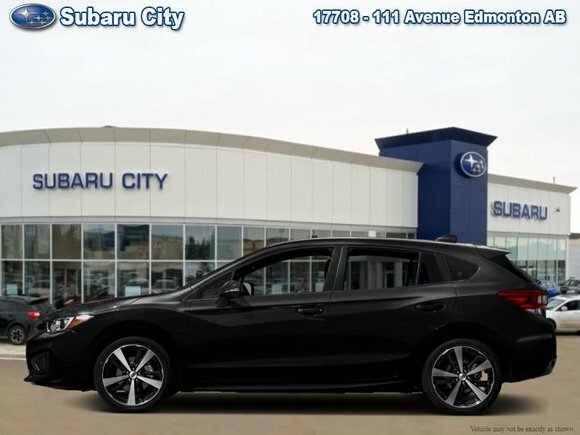 This vehicle has been upgraded with the following features: Sunroof, Bluetooth, Heated Seats, Rear View Camera, Siriusxm.